Amazon has slashed its UK tax bill just as it stands accused of fuelling the crisis on the high street. Despite soaring sales of close to £2 billion, the web giant’s biggest UK arm yesterday revealed it had paid just £4.5 million in corporation tax last year. That was down from £7.4 million the previous year – when its sales were actually lower. The news last night enraged retail campaigners, who believe Amazon’s success has contributed to the high street crisis that has seen tens of thousands of jobs lost this year. They are angry that local shops are hammered by soaring business rates, while the web-based giant pays much lower rates on its out-of-town warehouses. The Mail has been campaigning for a review of business rates. Joshua Bamfield of the Centre for Retail Research, which analyses retail trends, said: ‘People will be staggered by these figures. At a time when major British retailers are in difficulties and having to pay more corporation tax than Amazon, it seems wholly unfair. Amazon has several registered companies in the UK, each for a different part of its empire. Yesterday, it published accounts for its Services division, which used to be called Amazon.co.uk. Essentially, this division looks after its warehouses and parcel delivery business. Financial statements released at Companies House revealed it had made £1.98 billion in sales in the UK in 2017, up from £1.46 billion the previous year. Operating profits in the UK tripled to £79 million last year. Yet its bill for corporation tax – which is paid on profits – plummeted from £7.4 million in 2016 to £4.56 million for 2017. The tax payment was partly slashed because Amazon made shares payments to thousands of staff. These are counted as a cost and deducted from profits. 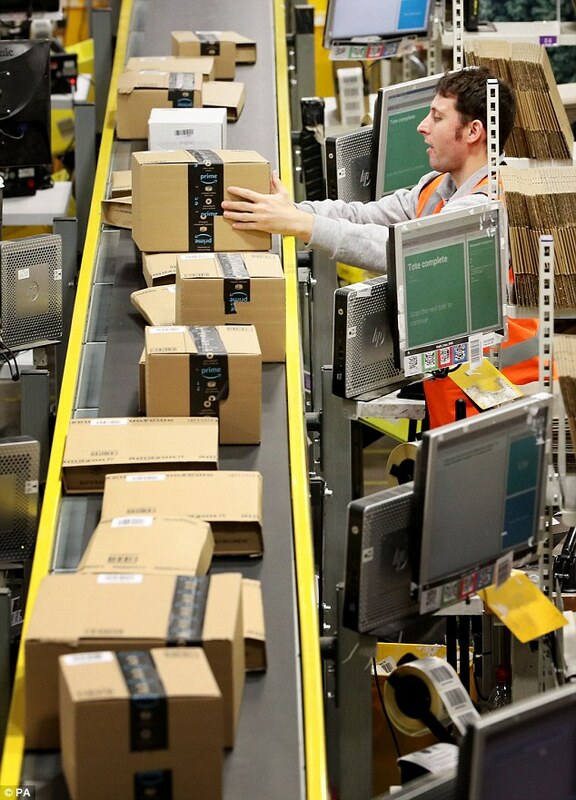 Had Amazon paid the UK’s standard rate of corporation tax, its Services subsidiary would have had to hand over £13.9 million, according to an analysis by the Financial Times. However, this still pales next to the web giant’s £2 billion UK sales. Because companies pay corporation tax only on profits, many tech firms use accounting methods to reduce their tax liability. These include increasing costs by making payments to other companies within the same group – often these can be in low-tax countries such as Luxembourg. They also hand out share awards. Earlier this year, the Mail launched a campaign for a review of the business rates system to help local stores and high street retailers. A Mail investigation earlier this year found that Amazon pays just £14 million a year in business rates for its 13 enormous warehouses – far below the costs faced by traditional high street stores. Struggling House of Fraser, which has been forced to close scores of stores and put thousands of jobs at risks, pays an estimated £36.2 million a year. Marks & Spencer, meanwhile, shelled out 12 times more than Amazon. James Daunt, chief executive of high street book chain Waterstones, said last night: ‘If tax bills fall disproportionately on one set of retailers, that’s not a level playing field – that applies to business rates and it applies to corporation tax. As Amazon enjoys huge profits in the first half of this year alone, 50,000 retail jobs were cut across Britain’s high street. This financial year, the taxman is expected to collect £30.8 billion in taxes from shops across the UK. In a world where online shopping is booming, many believe the business rates structure is outdated and reform is urgently needed. If not, there are fears streets could be left bare with retailers closing down and thousands of jobs lost. A spokesman for Amazon said: ‘We pay all taxes required in the UK. ‘We’ve invested over £9.3 billion in the UK since 2010, including last year opening a new head office in London alongside development centres in Cambridge and London.